He was never without a spiral bound tablet in which he jotted or drew some of the things he wanted to remember or do. The book was an example of the way he prepared himself and his little sloop for a record-breaking run across the North Atlantic, including diagrams of where he stowed his clothing and personal items. Every square inch of bilge space was accounted for. He even created a weight distribution plan, and a method for living for long periods of time at sea. Since he couldn’t wash clothes in the salt water—and I suppose that in a 10-foot boat he didn’t really want to bother—he made visits to Salvation Army and other used clothing stores to buy clothing, wash them, air dry them at length outdoors, and store them in sealed large plastic condiment jars. He got these jars for free from a local school cafeteria. He carried 35 pairs of shorts and T-shirts; 35 pairs of socks, 2 pairs of long johns, 10 pairs of pants, 10 pairs of short pants, 28 long-sleeved shirts, 8 short sleeved shirts, 2 belts, 5 caps, 1 pair of wool gloves, 3 pairs of rubber gloves, 3 pairs of tennis shoes, 1 down jacket, 5 sweaters, a scarf, 2 foul weather suits and 1 poncho. Each item was twisted up thoroughly so that it took up a minimum of space. He once showed me how little space a properly compacted a T-shirt required—I was amazed. Stylish fashion and pressed shirts were not his goal at sea. The provisions added up. His empty hull weighed 750 pounds, but at departure with his clothing, food, gasoline, and all his gear aboard, Yankee Girl weighed 2,200 pounds. On his voyage, he tossed his old, dirty clothes overboard to disintegrate in the ocean. His “book” showed him where to find each sealed condiment jar and what each contained. The jars of clothing served another function. During one stormy period, when the 10-foot boat fell off waves and bounced about terribly in high seas, the sealed up boat cabin became stuffy and foul smelling. He couldn’t open his ventilator because waves regularly overran the boat. He tried opening his hatch even for a short while but that only produced regular drenching below and he had to remove the water with a meat baster. Marlin Bree (www.marlinbree.com) is a contributing writer to Small Craft Advisor and the author of numerous boating books, including his own Boat Log & Record (SCA Library). 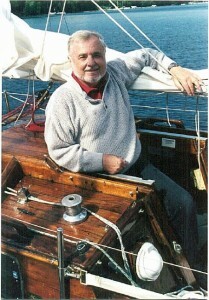 He has twice won the coveted Grand Prize Award in Boating Writers International’s annual Writing Contest. 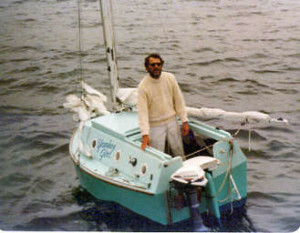 Gary Spiess wrote a wonderful book, “Alone Against the Atlantic”, about designing and building Yankee Girl, preparing for his voyage and his trip across the Atlantic. If Small Craft Advisor readers haven’t read Gary’s book, I encourage them to do so. I read his book. Once I started I couldn’t put it down. I stayed upmost of the night reading. I also encourage people to read the book. Thank you Mark. It’s always a pleasure to get feedback from another sailor. You might go on in your reading to my Broken Seas, which tells about Gerry’s attempt to take his Yankee Girl across the South Pacific. This book is in the SCA Library. I had a hard job reckoning with his amount of fuel taken onboard, though i do understand his reason for doing so. When boats get too small to beat reliably to weather, they can be a liability. Hardly a gas hog of an engine, but with limited sailing ability, strong tides and weather in the approaches of the English Channel, i could understand the desire for it. Never been into the record breaking mind set, but as a small boat journey, and certainly the logical prep work involved, was a worthwhile read for anyone doing any voyaging, no matter what size boat. Really, all that clothing? Not sure why one would need a new pair of trousers every four days? Was he setting a fashion trend?….2 different belts? What was he thinking? That he’d lose one overseas? Ah, with five different caps perhaps he could have more of a choice?…..relieve the boredom. Eccentricity knows no bounds…..thankfully. Gerry could not wash nor dry clothing inside his 10-foot Yankee Girl. Before he departed, he had a list of “problems” he might encounter on his anticipated 60 to 90 day voyage across the North Atlantic, and he made a list in his “book.”As you can imagine, keeping dry and warm was high on the list. His solution: not wash or dry clothing, but instead toss wet clothing overboard and get out some dry clothing from one of the food condiment container jugs he had in the bilge. These are the ordinary industrial-sized plastic jugs that schools use (He got them from the kitchen of the White Bear Lake, MN, school he used to teach in) and they not only hold a lot tightly –very tightly — twisted clothing — but they keep everything dry. So when he got a faceful of wave, he didn’t bother to try to dry it out belowdeck, he just got a new item. By the way, these were clothing items he got from the Salvation Army and he washed them many times and hung them out to dry prior to his voyage in his Minnesota backyard on a line, so they could air dry.